History is my FAVORITE. I love to linger on events and time periods, give me a good historical fiction novel and I will loose myself in it for days. When a story is told well, it captures your attention and draws you in. Enter Dave Stotts. We have been immersed in early American History for the last 6 weeks through the new Drive Thru History Adventures. Our host Dave has taken us on a virtual fieldtrip right into battlefields and homes of figures like Paul Revere and William Penn. We have laughed hysterically at his antics and gained a deep understanding and appreciation for the people that founded our great country. 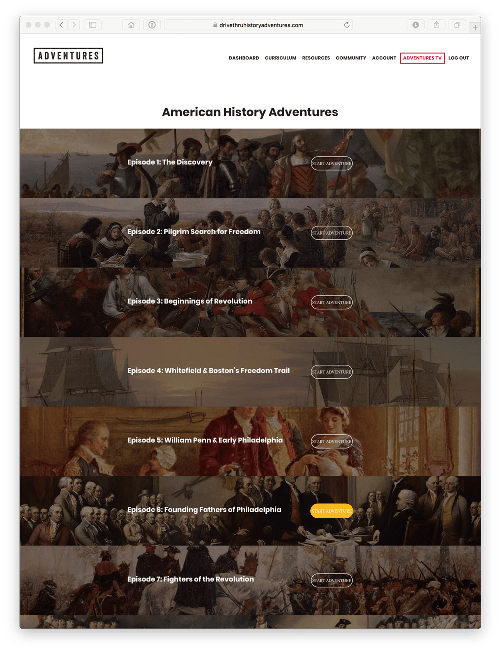 The American History Curriculum has 12 episodes, each about 27 minutes long. The curriculum will move you from the discovery of our nation through the Revolutionary war. With each episode you will be introduced to the people and places where the events took place. You will walk along with Dave into historical buildings, battle grounds and other famous places, all the while learning fun and interesting facts. Once you have watched the video you have access to worksheets to check for understanding along with suggested readings, and art work to go along with it. I appreciate that the suggested readings are primary resources, like the Declaration of Independence and the Mayflower Compact. Before we got started I printed off all the worksheets and the extended readings and put them in a binder so that we would have easy access. Sometimes we worked on the questions together and sometimes we did them independently. My youngest daughter, who doesn’t even read yet loves the videos and asks to watch them often, she can even answer some of the questions on her own. I think this curriculum can easily stand on it’s own, especially if you are adding some novels or other readings to it. Or it could be used as a supplement to something you are already doing. The online subscription gives you access to all the videos and readings along with the curriculum. With your subscription you also receive access to Adventures TV. With Adventures TV, at the touch of a button (or phone screen) you can stream over 40 videos and counting. This can be downloaded and streamed through any device. This curriculum has so much to offer. It does all the work for you. Whenever we study a subject, I’m at the library looking for books, I’m downloading videos or checking them out, writing up discussion questions and finding worksheets or projects to go along with what we are doing. This curriculum does all the hard parts for you. Unless you like projects… sorry Dave doesn’t do those. If you are a history fan like me, or just enjoy a great documentary, The Drive Thru History crew is offering 20% off for readers of The Old School House Magazine. You can find the coupon on page 19 in the digital version. And… if that wasn’t awesome enough, right now if you purchase the Annual Subscription you will receive a set of the Gospel DVD’s. You can connect with Dave and the Drive Thru History Adventure team on Facebook, Pinterest, and Instagram. See what the rest of the Homeschool Review Crew thinks about Drive Thru History Adventures Here.